I tend to use my browser state (and plenty of tabs) as lightweight bookmarks. This means leaving a couple of browser windows open perpetually. Often my machine is configured to sleep after about 20mins, but in the case of my work laptop it doesn’t sleep if plugged into the wall (intentional on my part). I don’t think my usage is atypical – I would not be surprised if several of my friends have similar usage patterns. This graph is from DD-WRTv24. 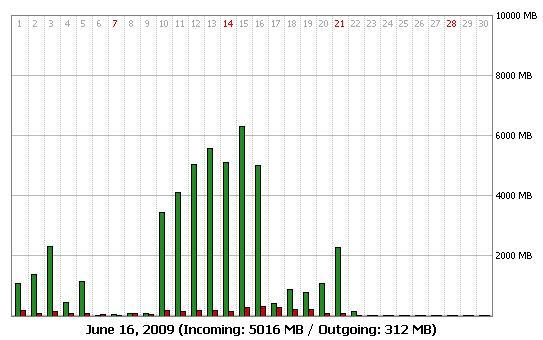 You might think “Ah, Roo’s just been doing some torrents” – but the truth is that almost all of the traffic from June 10th-16th and then the June 21st spike are due to a couple of open browser windows on my laptop (overnight). This was my conclusion last night at 2am when I closed 3 browser windows on my laptop and watch the bandwidth on my WAN port drop to zero bytes. You might have noticed the scale is vastly different. In fact, the usage for the entire month is basically the same as what I was pulling down in a single day. Consider the possibilities here. If you wanted to be evil, and you were say an ISP – you’d ensure that your customers default home page was a nice friendly AJAX enabled launchpad linked to webmail etc.. and you’d put something to cause a slow trickle download cost as long as the user has that page open. This would likely cause a fair percentage of your customers to consume more of their bandwidth cap sooner. This entry was posted on Monday, June 22nd, 2009 at 11:53 am	and is filed under Soap Box. You can follow any responses to this entry through the RSS 2.0 feed. You can leave a response, or trackback from your own site. So tonight I was experimenting to ensure that my laptop was off – along with my desktop. A quick peek in between late night feedings and it seemed that there was still significant network bandwidth being used. Exploring the network activity led me to Jenn’s Mac. It seems that Adium may have been causing this network activity. It did want to be updated which I’ve done, but I’ll have to keep an eye on it. For what its worth – this was a slow trickle of network activity (~200kbit/s) – not enough to really matter too much, but it added up if this ran for hours (I’m over 50Gbit transfer this month). So the supposition that it was a browser based problem is likely wrong given this new evidence, however the evil plan to hide traffic generating code in a webpage could be a concern. The moral of the story? 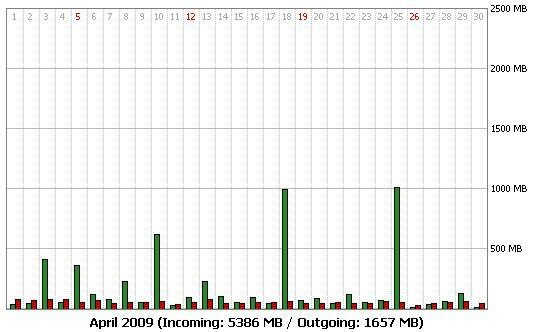 Its worth having logging/graphing in place to track your network usage. Sorry Roo was using your new machine for my iTunes collection. My bad. Ken – that reminds me that we need to setup an offsite backup story between our systems. However that would be unlikely to hit the same level of traffic that I was seeing. Upgrading to Adium 1.3.5 seems to have fixed the issue completely.